Rich 'Alaska Guy' Williamson, along with his wife, Linda, has been traveling to, from, and around Alaska on a regular basis since 2004. He recently obtained certification from the Alaska Dept of Tourism as an 'Alaska Certified Expert'. He is also a member of ATIA (Alaska Tourism Industry Association). He is uniquely qualified and experienced to assist the DIY (do it yourselfer) traveler to make plans to visit Alaska. 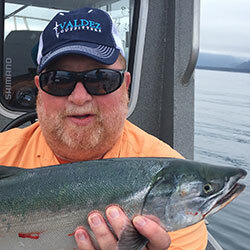 Rich has experienced Alaska fishing, hiking, canoeing, berry picking, and camping. He is uniquely qualified to guide you to experience the trip of a lifetime. Warning: Alaska is addictive. You will want to return time after time. He has developed a resource, available for free distribution, 'Alaska Travel, Paddling, & Fishing Planner Resource Guide'. He can be contacted at: alaskadiyguy@yahoo.com and has a blog on www.QuietJourney.com. Please join at the 'Inukshuk' level. Everything about Alaska is epic! Alaska has 12,000 rivers, over 3,000,000 lakes, and nearly 34,000 miles of shoreline. It is impossible to paddle all of it. The question is, "Where do I start?" Whether you have a day, a week, or longer, there is a wilderness paddling adventure awaiting you in Alaska! Rich has paddled with his son-in-law and grandson, experiencing the wild grandeur that is only found in Alaska! Hear an overview of some of these adventures, covering logistics and other considerations, so that you can plan your own adventures. If Alaska is on your radar, you will not want to miss his presentation! Free printed planning information on Alaska will be distributed to attendees.